OKAY. So I am finally going to address this question because we have consistently been asked since the moment we changed it LOL. Also my little sisters friends keep bothering her about it so I thought – MIGHT AS WELL WRITE A BLOG POST. First and foremost there is no time in the near future that we are going to change our Blog name from Mimosas and Manhattan. We feel at this point that we identify it, love it, own the trademark to it, and it has weirdly become part of us. So to all the lovers out there no need to worry about that! Secondly we did not change it because of any *drama* so anyone that is looking for a juicy story out there, you aren’t going to find it! I wish there was some crazy drama that happened but sadly no. To start on this topic – We came up with our name @MimosasManhattan “Mimosas AND Manhattan” (everyone always think we are Mimosas IN Manhattan – so have to emphasize the AND – lol) when we were 20 & 21 years old about 5 years ago now. To put that into context we are A LOT different now. At that point in our lives we were each living in Manhattan without a penny to our names, un paid fashion internships, bottomless brunching at any bar that did not ID. We were college students! Fast forward to now…. life is a lot different. For starters we don’t even live in Manhattan & we honestly rarely bottomless mimosa brunch anymore. I swear we are still fun though! We just have I guess… grown up. And with growing up comes letting go. It felt like it was time. The second reason we changed our handle was that we worried we were beginning to get pigeon holed. So our name is kinda of cutesy, has alcohol in it, and we were beginning to get passed over for opportunities due to it. We didn’t want to be judged on our name but the content that we were producing. 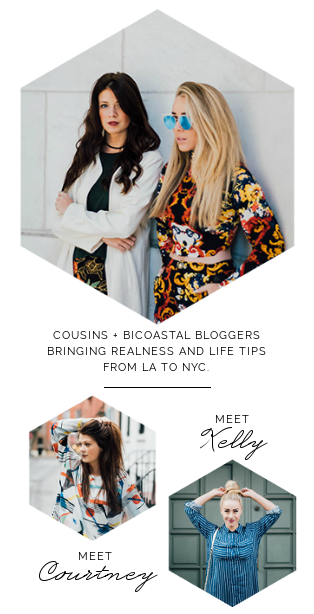 We felt just being ourselves (@courtandkelly) gave us a blank slate. Somewhere that makes a reader want to learn more and judge us off of our photos rather than the cutesy title Mimosas and Manhattan. At the end of the day it was a sad day when we let the @mimosasmanhattan go. It was the ending of a chapter of our lives. But it opens us to this next chapter, where who even knows if we will still be in New York or what our future holds. To be honest there are a lot of life changes the 2 of us are going through right now. I wish we could tell everyone at this moment but we want to wait until our life paths are a bit more clear. Everything happens for a reason and we can’t wait to continue going down the path of life with you all!